Murder is only perfect when everyone knows you got away with it. Edana Fortunato is the sole surviving heir of two great families whose fates have commingled. On the eve of her inheritance, Edana is summoned to the grand estate to meet the enigmatic Count Montresor. She embarks on the journey, unprepared for the secrets still to be revealed, and unaware that a killer has set the stage for one final act of vengeance upon the Fortunato family. 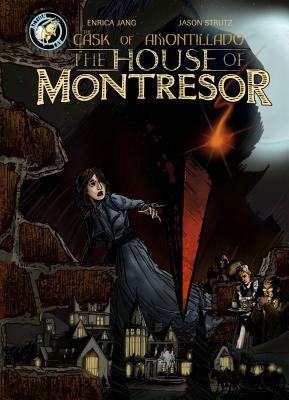 Revenge does not end in THE HOUSE OF MONTRESOR, a sequel to Edgar Allan Poe s classic revenge tale, The Cask of Amontillado. This one was pretty good. I wasn't sure what I was going to get out of it. But I was surely scared with some of the artwork. I will be using this one in the days to come to work on my own artwork. This one is so interesting though. I can't wait for more! If you are a fan of families that are at war then pick this one up now!